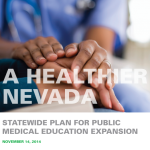 The impact of the future of health and economic well-being in Nevada. 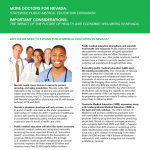 In September 2013 the Nevada System of Higher Education (NSHE) Board of Regents Health Sciences System Committee (HSS) made the bold move to identify the critical need to expand public medical education in the state of Nevada. A cornerstone of this initiative stressed the vital importance and significance of coordination and collaboration among the System’s university presidents to build on this idea. Shortly after, the Board of Regents (BOR) directed Chancellor Daniel Klaich to work with the leadership of the University of Nevada Las Vegas (UNLV), University of Nevada, Reno (UNR), and community business leaders in a Statewide Public Medical Education Expansion Steering Group (SSG) to develop a collaborative and comprehensive plan for public medical education expansion in Nevada. 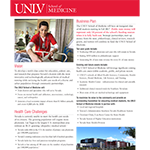 To develop a world-class center for education, patient care, and research that prepares Nevada’s doctors with the most innovative and technologically advanced forms of medical training while servicing the health care needs of a diverse and urban population through community partnerships. 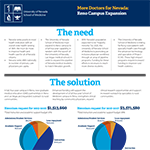 The case for expanding graduate medical education programs for the University of Nevada School of Medicine.